I’m in Florida this week and I always want to cook lighter when I am here. These Papaya, , Lettuce Wraps are light, delicious and low in calories and gluten free. Try this delicious recipe if you want to get away from the cold weather or if you are actually enjoying the warm gentle breezes of the South like I am. Slice the papaya, mango, and cucumber into matchstick size slices. 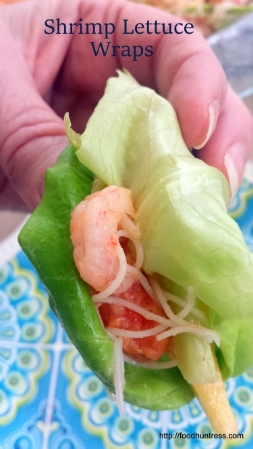 You can choose between salad shrimp up to medium size shrimp for the lettuce wraps. The salad size ones seem to stay in the wrap better. This is the Chili Garlic Sauce that I like to use in the peanut sauce. It’s spicy and garlicky. A little bit goes a long way. In the recipe, I’ve recommended 2 teaspoons for the sauce but there is no reason that you couldn’t go for more if you like your sauces extra spicy. Add a little at a time to the peanut butter, coconut milk, pineapple juice mix to get the right spiciness that fits your palate. Doesn’t this peanut sauce look creamy and delicious? 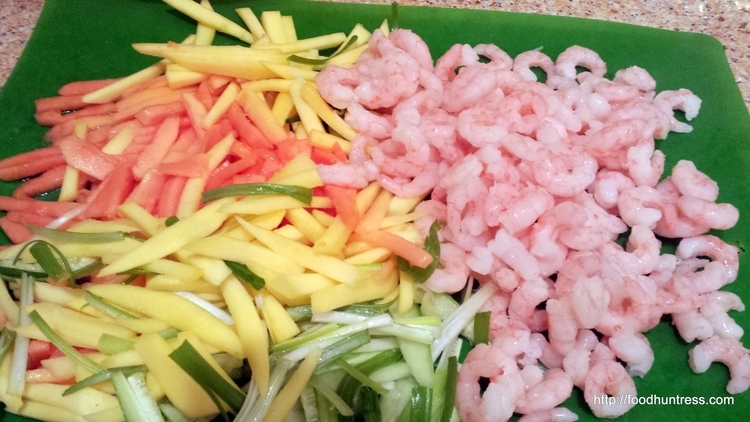 Stir half of the sauce with your noodles, papaya, mango and cucumber, green onion and shrimp mixture. 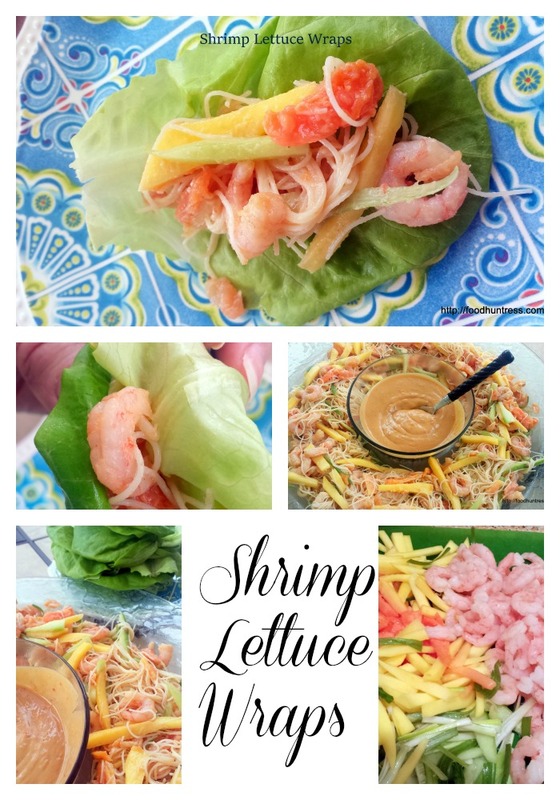 Serve the other half of the peanut sauce on the side to add that extra flavor to your shrimp lettuce wrap. 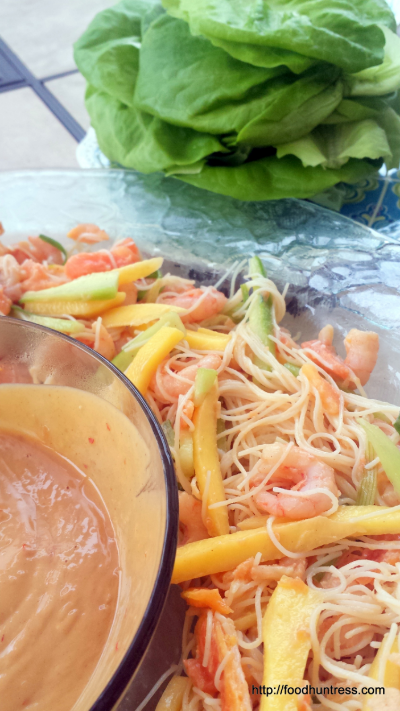 Mix papaya, mango, cucumber, cooked rice noodles, and cooked prawns in bowl. To make sauce, combine peanut butter, coconut milk, pineapple juice, chili garlic sauce, sesame oil with a mixer. Add 1/2 sauce to noodles and toss. Place noodle mixture on a platter and sprinkle with cilantro and green onions or stir the cilantro and green onions into the mixture and then place on a platter. Arrange whole lettuce leaves on large platter and divide noodle salad among lettuce leaves.